So I messed up. 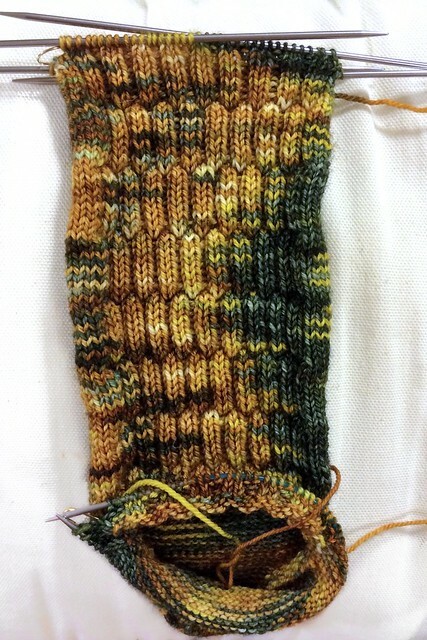 I'm (slowly) working on a pair of socks right now for Dan and I was attempting a short row toe. Only thing with a short row toe - you have to know how many total stitches you will use for the sock and then you have to do a little math and accurately count to make the short row toe work. Well, apparently I forgot the whole "accurate" part of the counting thing and ended up with way-too-pointy sock toes. At times, I'm okay with minor mistakes in my socks. But something like this? Not so minor. And the fact that the socks are for Dan made it doubly important to do it right. Which means I had to fix the too-pointy toes. I could rip them back, but one sock was past the heel - half way done! - and the other was almost as far. So I took a deep breath, braced myself up and unravel the toes. It took about two hours to do the first (short row turns apparently can't be simply frogged when unraveled counter to the direction knit) but the second one only took an hour. Then I got all the now live stitches back on the needles and I reknit the short row toes (making sure to pay attention to the whole counting thing). Then, a little kitchener stitch and ta-da! 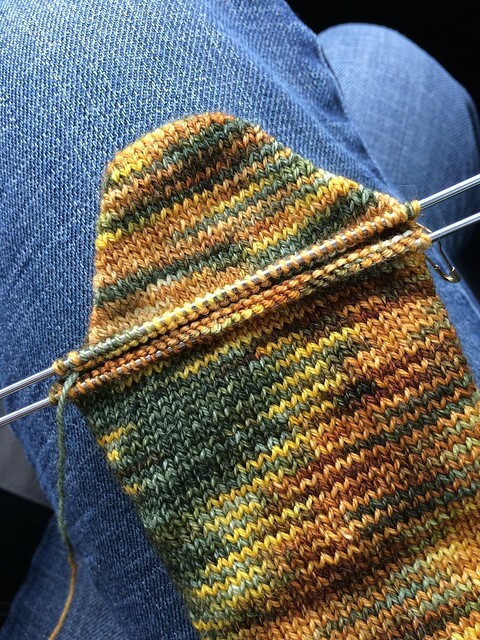 Sock toes that aren't too pointy and another knitting merit badge! I'm so relieved that I was able to fix Dan's toes. There was a lot of nervousness involved in the fix since I had never done such a dramatic fix before. But now that I've done it once, I have the confidence to do it again if it ever pops up. Win all around! Of course, too-pointy toes aren't the only sock-related things around the house that have needed fixing lately. Dan's first pair of socks had a spot that had begun thinning out so I set up to reinforce the thin spot with some duplicate stitch. 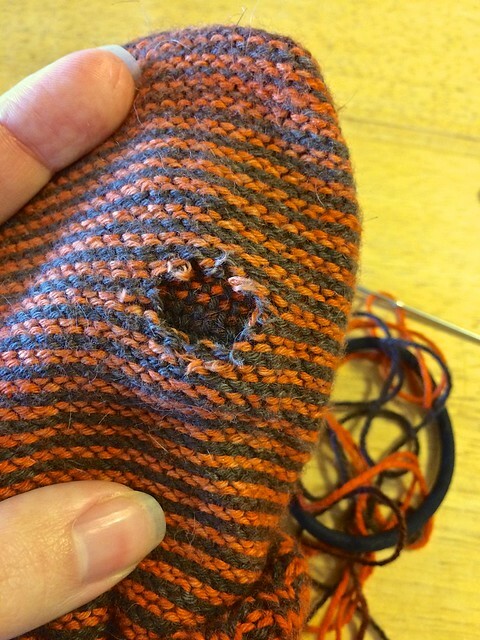 Unfortunately, when I started to repair the thin spot, the worn yarn gave way creating a honest-to-goodness hole. Now, I don't love getting holes in my socks, but this hole did present me with an opportunity. A while back, I picked up a Speedweve from eBay and an actual hole gave me a great chance to give it a try. 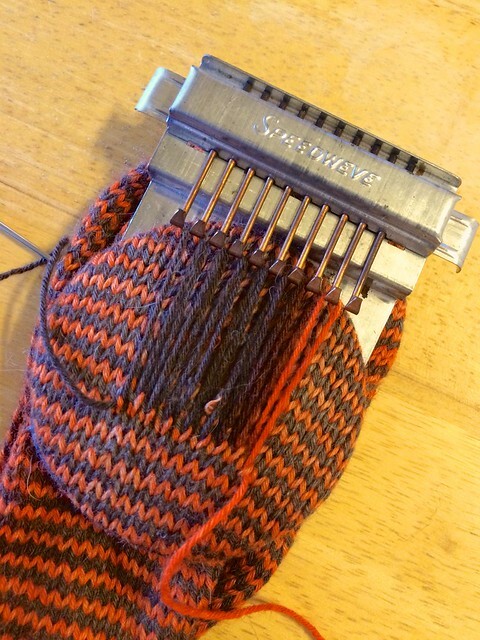 Basically, the Speedweve is this little mini-loom contraption that you hook up to your sock to create a woven patch. You create a warp between the Speedweve and the sock then use yarn as a weft and weave it back and forth (attaching it to the sock on each edge) to create a little patch. It was pretty easy to do and it worked great! Dan even wore the socks the other day and said that he couldn't even notice the patch. I'm so pleased! 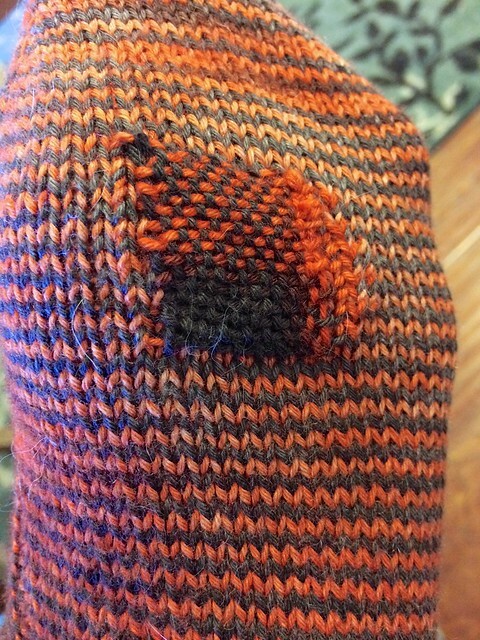 I'm now flying pretty high on my mad sock repairing skills. Go me! I do have a small darning egg but the size makes it best for smaller spots that just need reinforcement vs larger holes that need full on repair. Plus, I needed an excuse to play with my Speedweve! Home improvements have nothing to do with sock repair! Though, if they did, I'd be repairing lots more socks! And we will have a shower (and tub even) in the guest room. We just have to rip the current one out and put a new one in. Thanks for the posting. I just bought one of these off ebay, and it came without the wooden disc, which was as expected, but I didn't know what it looked like. Now I can make one on the lathe. I will have to guess at the dimensions, but that shouldn't be too difficult. If it helps, mine is just under 2.75" across with a slightly domed top. It's a hair over .5" thick with a .25" channel.